With the Maloof brothers mercifully agreeing to hand the keys over, the Kings are about to undergo some rapid change. Whether that takes place in Sacramento or Seattle is still yet to be determined, but one thing is certain – an NBA minus the Maloofs will be a better place. The general consensus in the blogosphere is that it shouldn’t be too hard to clean up this mess, and I agree with that, so I am going to put myself in the new owner’s chair and reveal my plan to turn this thing around. Joke-of-a-GM Geoff Petrie is out and I bring in Zach Lowe to run the show. I’m putting an end to the hiring of clueless chronies/retreads and former players to run an NBA franchise. The evidence is in – most of these guys couldn’t organise a piss up in a brewery, let alone make decisions that can affect the fortunes of a NBA basketball team for a decade or more. His knowledge is impeccable in every facet of the game – salary cap, x’s and o’s and judging a player’s worth and ability. I have no doubt that Lowe could get this thing moving in the right direction, and more specifically, clean out the crud. I would also consider guys like Kelly Dwyer (Yahoo! Sports), Rob Mahoney (Sports Illustrated) and Henry Abbott (TrueHoop) – all brilliant basketball minds – for front office positions. The Memphis Grizzlies recent hire of former ESPN writer John Hollinger has hopefully paved the way for such moves, with respect to the rest of the league. Keith Smart goes and I offer Stan Van Gundy a lucrative long term contract (five years if I have to). I would give Stan carte blanche to do whatever he needs to do to completely change the culture here, and if that means upsetting ‘star’ players then so be it; if they can’t stand the heat, those players – no matter who they are – will be moved. If Stan’s not interested in the job Nate McMillan would be my fallback option. The plan going forward is to build through the draft with high-character guys and players with a defensive pulse, so I would be pouring a lot of resources into the scouting department and player development. (Addressing their defensive shortcomings is essential because they’re abysmal on that end of the floor, which is no surprise given the personnel). In terms of what you’re immediately looking for in the draft/via trade etc., I would be specifically targeting a young point guard (gee, Damian Lillard would have been nice – they passed him over in last year’s draft) and an athletic/shooting three-man, who can defend. I’d listen very closely to what Lowe has to say here but my initial thoughts are these – first off, I’d remove the dead wood – John Salmons, Marcus Thornton, James Johnson and Travis Outlaw. If you can’t trade them or give them away for pennies on the dollar then you find a way to cut them loose (stretch provision, waive etc.) and take the hit if necessary because these guys make zero sense on this roster. Just removing them should ultimately be addition by subtraction as you go forward on a rebuild. The remaining players are worth a serious look to determine their suitability going forward or sussing out their trade value (no one should be untouchable on this roster). I am convinced that with the right structure in place, one with strong leadership and discipline, DeMarcus Cousins and Tyreke Evans are salvageable as potential big time players in this league. Look, it won’t be easy to straighten these guys out (especially Cousins, who let’s be frank is a dead set nutter) – they have no idea how to play team basketball and are riddled with bad habits – but it’s worth giving Stan a crack to find out exactly what you have here. And I think that would reveal itself pretty quickly, whether or not they could survive and thrive under SVG. If they can’t (high probability with Cousins), you cut bait and move on. I believe that Jimmer Fredette, Isaiah Thomas and Jason Thompson could all be good role players (preferably off the bench) on a winning team in the right situation, but the reality is we really don’t know how effective they can be because they’ve been toiling away in a messed up organisation that clearly had no idea how to develop players and maximise their talents. Patrick Patterson may also be a useful player as a stretch 4 going forward. 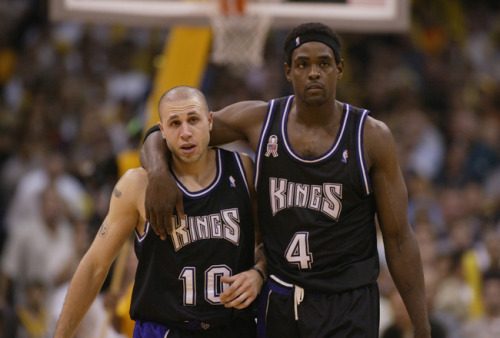 If the Kings remain in Sacramento I would change their uniform back to the clean looking mainly black unis worn in the Chris Webber era (below). The current version is horrid. 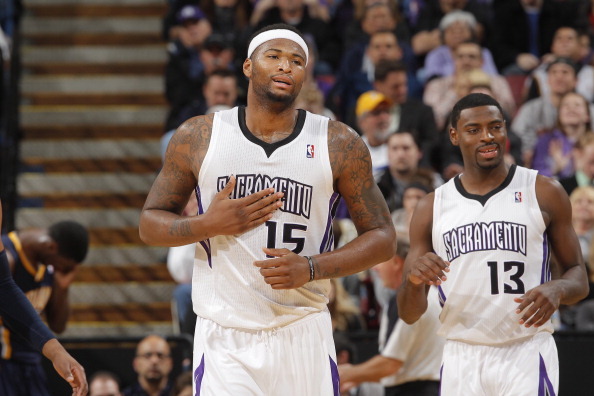 Stan and DeMarcus. I would like to see that. The problem with the Kings is management. It’s ironic bc the Maloof brothers were too cheap, but Vivek is a nut and too careless. Sure he spends money, but he hired Vlade Divac to run the team even though he was out of the NBA for 10 years!! Amazing!